If you’re like me (Shon, by the way), you love a good book. I am always interested in reading about others’ travel experiences, particularly if those travelogues coincide with my own travels. As a kid, I loved comic books, and when I heard about a graphic novelist who writes and illustrates serious travelogues, my interest was piqued. A friend loaned me Guy Delisle’s “Jerusalem,” and it blew me away. Since then, I’ve become a big fan. 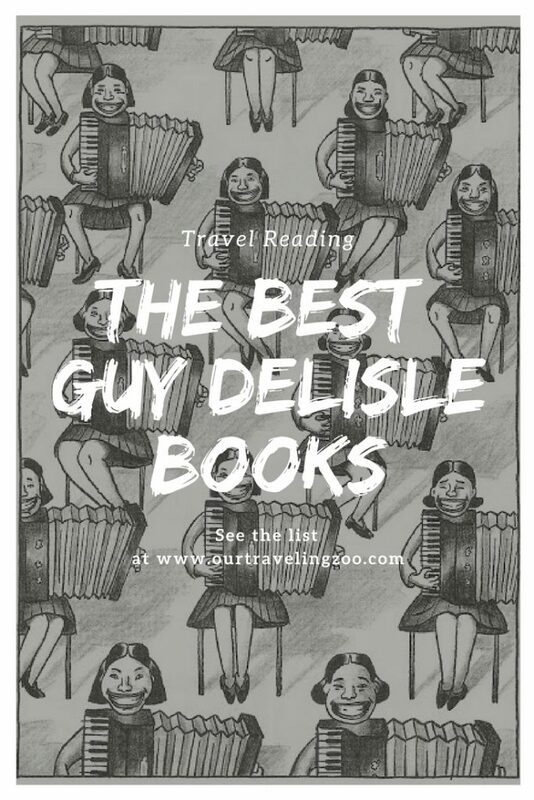 If you’re drawn to books about travel and you haven’t yet discovered Guy Delisle, you are in for a treat. Delisle’s graphic novels are created in a clean, distinctive and often sparing style. They can be, much like travel itself, downright illuminating. I’d heartily recommend any of Delisle’s books about travel. They are easy to read, but meaty enough that you will remember them long after you put them down. Despite Delisle’s cartoonish illustrations, he deals with subject matter that is mature and serious, while never crass or repulsive. Guy Delisle, a former animator, has had eight graphic novels published. They’re not all travelogues, but those are what he is best known for, and those are mainly what we’re talking about here. Here are the best Guy Delisle books, ranked 1-5. We’ll leave the three books he wrote on parenting for another time. Read without fear of spoilers; we hate those. Since graphic novels are by nature fairly brief, to say too much is to ruin the story. Keeping that in mind, here is Our Traveling Zoo’s ranking. 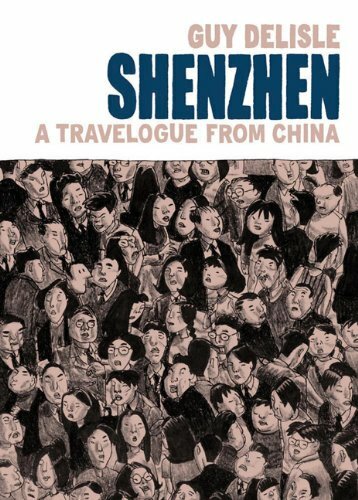 We currently live in Shenzhen, and it’s been fun to consider how it seemed to Delisle and how it seems to us. Sometimes I notice myself feeling the same frustrations that Delisle recounts in his narrative, particularly in the way people interact with me. It’s also notable how much has changed since Delisle worked in Shenzhen as an animator. The city is much more open now. This is a fairly short graphic novel, making it an easy read. It also has the least emotional resonance of the books listed here, despite some astute observations about life, culture, and crowds. “Hostage” is not a travelogue, that’s true, it’s a nonfiction recount of the kidnapping and hostage situation of a Doctors Without Borders administrator who was working in Chechnya. But it bears mention as it’s about life in a foreign land. 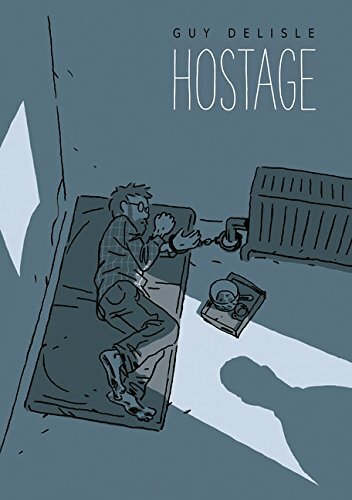 The artwork in “Hostage” is more realistic than usual for Delisle, and coupled with stark colors, the effect is more than a little haunting. As a story, it’s surprisingly tense, but in the end it seems it doesn’t quite know what point it’s making. That said, one of Delisle’s strengths is his ability to craft a narrative which doesn’t preach at its readers. “Hostage” can easily be part of a larger conversation. How does an ordinary person deal with being a captive in a hostage situation? What was going on in the world when the kidnapping happened? What does the hostage’s experience tell us about that time and place? While it doesn’t move me like the top books on the list, it’s still quality, thought-provoking material, and well worth a read. “The Burma Chronicles” is a good one, about Delisle’s time in Burma/Myanmar while his wife worked there, and I happily recommend it. What makes it so great? There are lovely moments of humor, punctuated by moments of emotional power, all within a framework that is informative and illuminating. Delisle approaches his subject matter as an outsider and learns about the place he lives from being there. 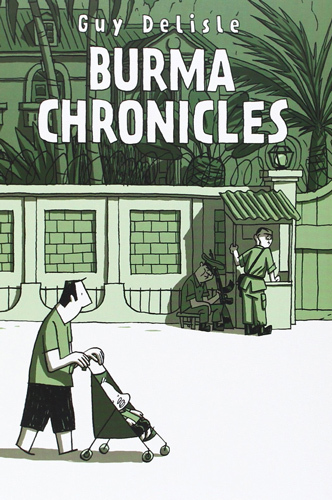 That works beautifully with “The Burma Chronicles,” where, as you can see on the cover, Delisle does simple things like push his kid around in a stroller and observe daily life. As Myanmar develops itself as a tourist destination, and as the Rohingya are in headlines, this is a timely read. 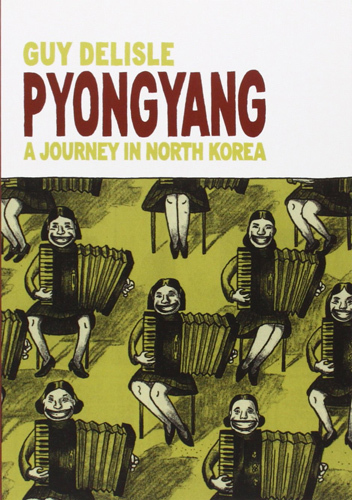 “Pyongyang: A Journey in North Korea” is the graphic novel which, as publisher Drawn and Quarterly says, made Deslile’s career. It’s an award winner, and deservedly so. It chronicles a trip Delisle made to North Korea to work as an animator, and brilliantly depicts the rift between what visitors to North Korea are presented with and the reality within which actual North Koreans live. The sparse style suits the subject matter perfectly. I am still somewhat haunted by the story and its images, particularly one of a beautiful but entirely empty skyscraper. Check this out soon. Undoubtedly my favorite Guy Delisle book, Jerusalem ranks best because it really shines a light on a place all too often politicized or misunderstood. 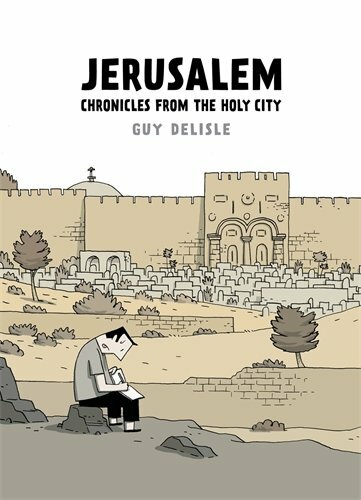 Jerusalem is a city of keen importance to three religions, and Delisle does a fantastic job depicting the complicated, conflicted reality of life there. Again, Delisle lived in Jerusalem while his wife worked there. To say too much would be to give it away, but “Jerusalem” employs Delisle’s wit, warmth, and keen observational eye to maximum effect. Go buy Jerusalem now and enjoy the best of Guy Delisle. There’s so much to recommend about these graphic novels. I am sure you’ll enjoy any of them if thought-provoking travelogues are up your alley. Are you also a Guy Delisle fan? What is your ranking of his books? Have you read and do you like his parenting ones as well?